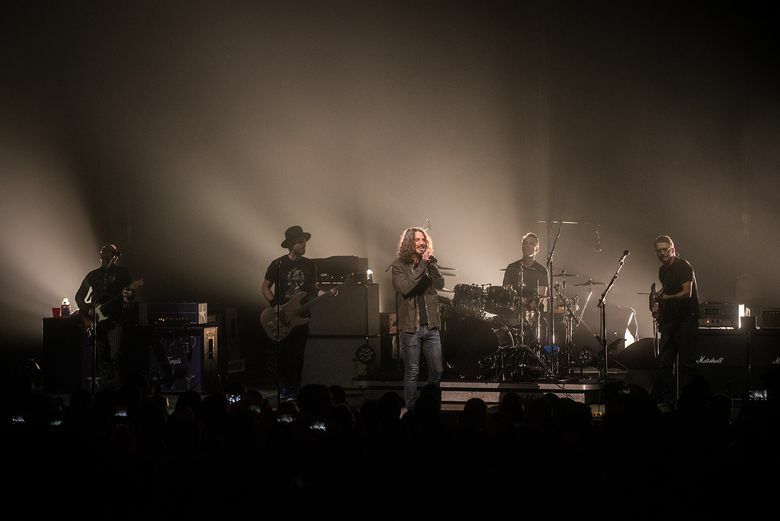 Twenty-five years after the release of its only album, Temple of the Dog — inspired by the death of Mother Love Bone’s Andy Wood and featuring members of Soundgarden and Pearl Jam — played the first of two nights at the Paramount Theatre Sunday, Nov. 20. Seattle music fans had waited 25 years for the moment when a reunited Temple of the Dog took the stage at the Paramount Sunday (Nov. 20). It was an “only in Seattle” show, filled with stories about problems with parking on Capitol Hill, behind-the-scenes tales of the grunge-era movie “Singles” (set in Seattle) and a Jimi Hendrix cover. The evening also included songs and memories of the late Andy Wood, leader of the Seattle band Mother Love Bone, whose untimely death in 1990 inspired Soundgarden’s Chris Cornell to form Temple of the Dog. The sold-out show was highly anticipated, as Temple is essentially a combination of Pearl Jam and Soundgarden. Another sold-out concert follows Monday (Nov. 21). Technically, there were five other cities on this Temple reunion mini-tour. But lead singer Chris Cornell said it was a relief to play his hometown, where “most of these songs were written,” and where the audience knew Wood’s role in music. Cornell’s bandmates included Mike McCready, Stone Gossard, Matt Cameron and Jeff Ament. Sunday’s show marked the first time all five had played a full-length Temple of the Dog Seattle concert since December 1991. Their musicianship was steady and they all seemed to have improved with age. The only element missing was Eddie Vedder, who because of previous family commitments couldn’t reprise his “Hunger Strike” vocal on the album. The crowd sang the part, as they sang every lyric all night. Some of the nostalgia for Temple stems from the enduring appeal of “Hunger Strike,” which became a huge MTV hit in 1992. For many it represented a seminal moment of grunge. Before the evening’s first encore, Cornell talked about how hard it was to lose Wood. He said the love Seattle showed Sunday proved that Temple of the Dog had succeeded. “The fact that you guys are here tonight celebrating an album we made 25 years ago shows that one of the main objectives has been met,” Cornell said. Then he played solo one of Wood’s best songs, “Man of Golden Words,” which includes the line that gave Temple of the Dog its name. The crowd shouted out that line, making the evening feel like a particularly significant Seattle moment in music history.